What is a Trauma Anniversary? Certain times of year bring old memories and associations to mind—for example, the holiday season may find you thinking more about family or personal ties, whereas the summer might get you focused on planning your next getaway. Much of the time, these associations are pleasant and connected to strong memories that are tied into your identity. 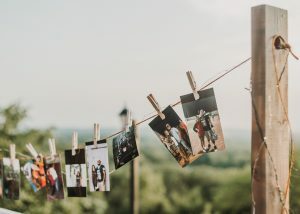 Sometimes, however, the memories aren’t so enjoyable, especially when they’re connected to a past trauma. Many trauma survivors experience challenging “anniversary reactions,” which are defined as “unique set[s] of unsettling feelings, thoughts or memories that occur on the anniversary of a significant experience.” When a survivor finds themselves in the midst of an anniversary reaction, they often are forced to re-live feelings from the traumatic event, causing symptoms like increased anxiety, depression, trouble sleeping, loss of appetite, nightmares, and irritable outbursts. Understandably, trauma anniversaries can be confusing and upsetting. 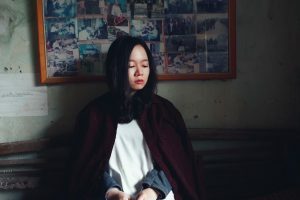 In addition to being emotionally challenging, they may also make us feel frustrated that after coming so far in our healing journey, we appear to be “reverting” to old symptoms. Bursts of unexpected anger or worry may also threaten to damage our relationships, careers, and overall wellbeing. It’s important to know that if you experience an anniversary reaction, you are not “reverting” or losing all of the healing progress you have made. Ups and downs are a completely normal part of the healing process, and it’s extremely common for things to be difficult during times that remind you, even subconsciously, of the experience you’re coping with. There might be a good reason for this—some researchers believe that trauma anniversaries are actually a way of our minds trying (unsuccessfully) to help us by preparing us to protect ourselves from similar harm. Yet despite our mind’s good intentions, it’s not helpful for us to live our lives in a constant state of high alert. Chances are, you’re looking for ways to gain a little more control over your emotional experience during these anniversaries. Doing so is absolutely possible, and we recommend the following tips. Before you do anything else, you’ll want to identify when your trauma anniversaries occur and how they affect you individually. It’s surprisingly easy to go through life experiencing anniversary reactions without even recognizing them for what they are. Do you always feel depressed during a certain holiday? Do your breakups all tend to happen at a certain time of year, or do you feel extra anxiety during specific months? Create a timeline of your more difficult periods and try to discern whether there might be a pattern. In some cases, this may be indicative of seasonal affective disorder, but in others it may be due to a trauma anniversary. Once you’ve identified the patterns, look at how anniversary reactions affect you. Some people may become incredibly fatigued at a certain time of year, needing more time off of work and struggling to accomplish basic chores. Others withdraw from social contact, or conversely, become hyper-engaged in their social lives. Every person’s reaction looks different; when you identify yours, you can take more effective steps towards treating it. This is already a challenging time for you, so the last thing you need is more negativity—especially when it’s self-directed. Once you’ve accepted that this is going to be a difficult time, consider ways you can increase your self-care and compassion. For example, you may anticipate needing more support. Knowing this, you might schedule a lot of time with your loved ones, or even make a pact with a friend to check in via phone call on a schedule that works for you. You may also decide this won’t be an ideal time to take on any big tasks, so you might try to complete any major projects in advance or ask for support from your peers. If you’re asking for help in the workplace, you don’t need to disclose the reason—your coworkers don’t need to know the particulars. We all go through periods when we need some assistance, and if they don’t understand that, that’s their own issue. Even everyday tasks like cleaning and cooking can be cumbersome during these anniversaries. Are there things, like freezing meals in advance, that you can do to prepare? Maybe you can set aside a little money to have someone help you with cleaning, gardening, or other tasks that you just don’t have the energy to focus on. All the while, remember that you’re not lazy for needing some extra support. You wouldn’t blame your friends with physiological illnesses, like diabetes or fibromyalgia, for getting outside aid. You have the right to get support too! It may sound counterintuitive, but both the APA and the US Department of Veterans’ Affairs tout the benefits of “commemorating” trauma anniversaries. The idea is not to celebrate the date but rather to find a healthy way to express your emotions and, when possible, counter negativity with positivity. Make yourself laugh by seeing a funny movie or hanging out with your most hilarious friends. Rich and functional social support is a strong protective factor when it comes to both obtaining and preserving mental and physical health. In addition to providing us with an empathetic outlet for our stressors, friends, partners, and family can provide much-needed support during low periods and encouragement when we engage in healthy behaviors. It can be understandably difficult to open up, even to our closest loved ones, about experiences of trauma, and if you don’t feel comfortable doing so that’s perfectly okay. Just spending time with loved ones can have therapeutic benefits. That being said, you won’t want to deal with your traumatic memories and symptoms alone, which is where a trauma-informed therapist can provide invaluable support. In fact, working with a therapist with extensive training and experience working with trauma and how it manifests in the mind and body is among the most highly recommended treatments for trauma symptoms. There are a variety of therapeutic modalities that you can choose on, based on your unique needs and preferences—talk therapies like cognitive-behavioral and mindfulness approaches are very popular, and here at Viva we greatly appreciate the efficiency and cutting-edge nature of brain-based therapies like Eye Movement Desensitization and Reprocessing (EMDR) and Neurofeedback. No matter which modality you go with, we always recommend asking your clinician about their experience working with trauma to ensure that they have the expertise you need. Any good clinician will be happy to answer that question. 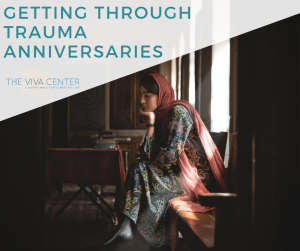 Trauma anniversaries are challenging, but you can get through them—and we’re here to support you however we can. We hope the tips above work for you, and also recommend the trauma resource page at the Resilient Brain Project, which features apps, blogs, podcasts, research, and more tools to help you learn more about and cope with trauma and/or PTSD. What has helped you get through a trauma anniversary? We’d love to hear from you.